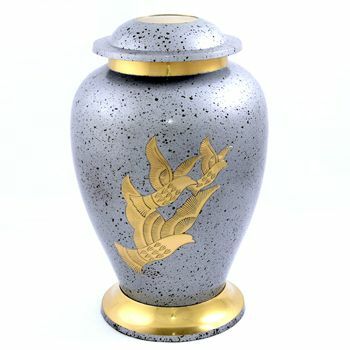 The Coming Home Urn is hand cast and made in solid brass with a beautiful glazed pattern around the urn. This urn measures 11’’ tall and will hold the full ashes of an adult. The ashes are placed into the urn through the top which is secured by a threaded lid. A Matching keepsake urn is also available, this will hold a small amount of your loved ones ashes, please select this from the product options below if required.